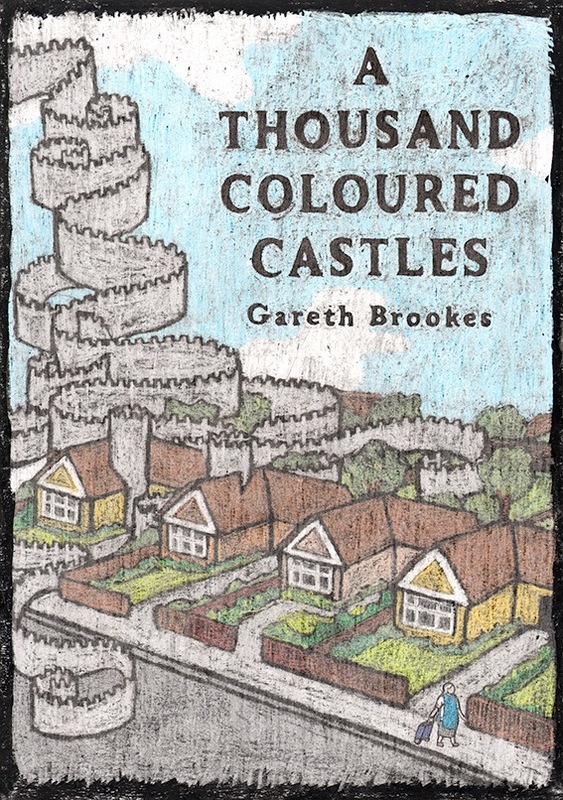 A Thousand Coloured Castles is Gareth Brookes’ exploration of Charles Bonnet Syndrome. Featuring an older woman, Myriam, who is diagnosed first with macular degeneration, this graphic novel explores Myriam’s strange visions as she sees figures like soldiers with ladders on their heads, plants growing out of telephone wires, and people with dressers on their heads. Myriam questions her own sanity and isn’t certain she wants doctors to diagnose her condition. When she eventually discovers that she has Charles Bonnet Symdrome, a condition related to deteriorating vision that causes complex visual hallucinations, she still has to deal with her husband and daughter who don’t understand her condition and disregard her, calling her barmy. Not only does Gareth Brookes bring attention to Charles Bonnet Syndrome in his comic, he brings attention to the way that the medical conditions of women, and particularly older women, are ignored or treated as personality quirks. Myriam is constantly ignored by her family and perceived as being someone whose perspectives and insights aren’t worth paying attention to. Gareth Brookes uses a medium of art that simulates visual deterioration, drawing his comics in crayon, covering them in black crayon and then scratching the top layer away to reveal the image underneath. The result is a darkened comic with fuzzy, black edges that the reader has to work to see, simulating the experience of visual disability. The comic uses faces without features to create universal images where anyone can project their experiences. These faces allow for the characters to be any person rather than fixing them to one identity. A Thousand Coloured Castles is a powerful comic that tells a story of disability, ageing, and being ignored. A graphic novel about a nurse’s experiences in an HIV/AIDS unit during the peak of the infection and when the infection didn’t have treatments that prolonged life as they do today seems as though it would be a depressing tale, and indeed it was. But, this was not just a tale of lives lost and the pain of losing friends and family, this tale was one of mutual support and community. The history of AIDS is one that is enwrapped in Queer history, and like many parts of our history, it is erased. Unlike many other cultures, Queer culture isn’t passed down through family lines from one generation to the next. We often rely on members of our community to share the Queer history that they have uncovered. M.K. Czerwiec helps to bring the history of the Queer community’s interactions with AIDS to new generations, letting us connect to aspects of our history not through the distant medium of history books that often bleed all of the emotion out of a historical event, but rather through her own personal experience with AIDS as a nurse who worked with people who were infected. In “Taking Turns”, Czerwiec shares her own story and how it touched multiple parts of the Queer community and the medical community as they engaged in a shared experience of AIDS. This is not a distant, pathological story, but instead one that is intensely personal, real, and relatable. The medium of comics is one that was intensely powerful for the story of a nurse in an AIDS care unit because it prevented the sort of cool standoffishness that often occurs when we talk about AIDS, a distancing technique that we frequently use to pull ourselves away from the memory of those lost to the virus. But, with a comic, the reader looks directly into the eyes of the patients. We see their transformations as the virus progresses. We see the medical equipment that surrounds them and shapes their existence. “Taking Turns” is an embodied experience where the story can’t be distanced from the bodies of the people involved. They are always present in the reader’s vision, preventing any pathologized readings or distancing. M.K. Czerwiec invites her readers into her world and her own history, making sure that we understand AIDS beyond the medical models we often receive. When I was growing up, those of us in the gay community received constant warnings about AIDS. AIDS was constructed as the boogeyman haunting every sexual encounter. Posters were everywhere at gay clubs and in health units, warning us that we were one thin piece of latex away from certain death. These posters generally featured images of condoms or drops of blood or needles, but rarely let us see the human faces behind AIDS, the people who experienced the virus. This contributed to a lot of the fear around AIDS and the fear directed toward people with the virus. Czerwiec’ comic is one that I would have liked to have read as a young Queer person. It would have helped to humanize the people who had AIDS in our community instead of distancing us from them. It would have been a reminder that we, as a Queer community, need to pull together and protect and support our community. “Taking Turns” is a painful narrative, but, more than that, it is a hopeful one – a tale of community coming together in a culture of care. It is a body story, one that is fundamentally about embodiment and the experience of living. So many AIDS narratives are about death and this one is also about life.